The Governor of West Papua, Domunggus Mandacan stated that currently 86 percent of his territory has enjoyed information through an electricity program implemented by the government and the National Electricity Company (PLN). “Hopefully the Papua Light 2020 program can be realized, so that 100 percent of the West Papua Province can enjoy electricity,” the governor said in Manokwari on Thursday. He is grateful that the central government has given serious attention to development in the area. In addition to roads and other transportation, information programs become one of the needs to spur community economic activities. Micro Gas) in Manokwari with a capacity of 20 Mega Watts. Hopefully in other areas it can also be done, “he said. As in the Sorong region, the governor said, the availability of electricity is very much needed to support the construction of Special Economic Zones (SEZ). Similarly, in the Integrated Economic Zone in Bintuni Bay Regency. “All regions, we hope to enjoy electricity services. Like in the Arfak Mountains, Teluk Wondama, Raja Ampat and other remote areas,” said the governor. The central government through the Ministry of Energy and Mineral Resources (ESDM) this year built dozens of PLTMG in the Papua and West Papua Provinces. 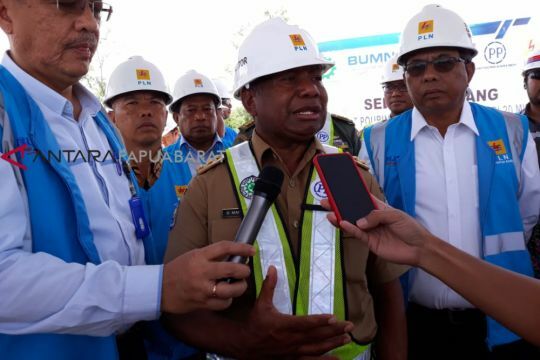 Maluku-Papua Construction Regional Executive Vice President Robert Aprianto Purbba at the inaugural PLTMG construction event in Manokwari, Tuesday said, the total capacity of the MHP will be realized in the two provinces in 2019, around 257.6 MW. The construction of MHP in the two provinces includes, Manokwari-1 with a capacity of 20 MW, Manokwari-2 20 MW, Sorong-1 30 MW, Sorong-2 20 MW, Serui 10 MW, Nabire 2.6 MW, Timika-1 10 MW, Timika-2 30 MW, Biak-1 15 MW, Biak-2 10 MW, Sarmi 5 MW, Merauke-1 20 MW, Merauke-2 20 MW, and Jayapura 40 MW. “This program will continue. Mr. President Joko Widodo is committed to implementing the Bright Papua program by 2020,” said Purbba. He said, for 2020 the construction of the MHP will be carried out in Raja Ampat, Bintuni Bay, Fakfak, Kaimana, Boven Digoel and Jayapura. This year the cost of development has begun to budget. He expects public support as well as the regional government so that the president’s joy in the Papua program in 2020 can be realized. PLN cannot work alone without the support of the community and local government.